Amongst his most fearsome troops were the brothers Ulfson. Some say their father was actually a wolf. 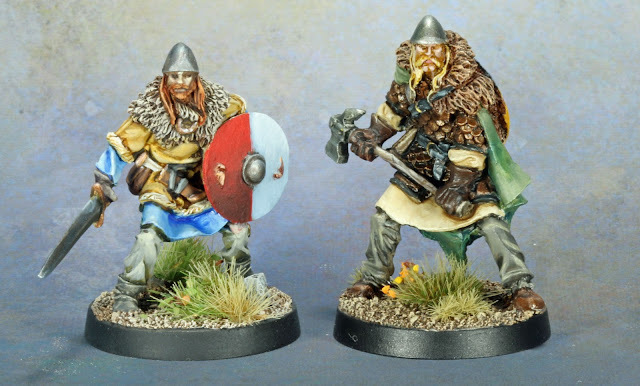 If you asked them about their parentage, they would give a sly smile and tell you it was they were only half brothers, for Geri was Hrolf's father while Freki was Snorre's father! Hrolf was the larger of the brothers; resplendent with his blond locks and beard and weilding a giant hammer in battle. 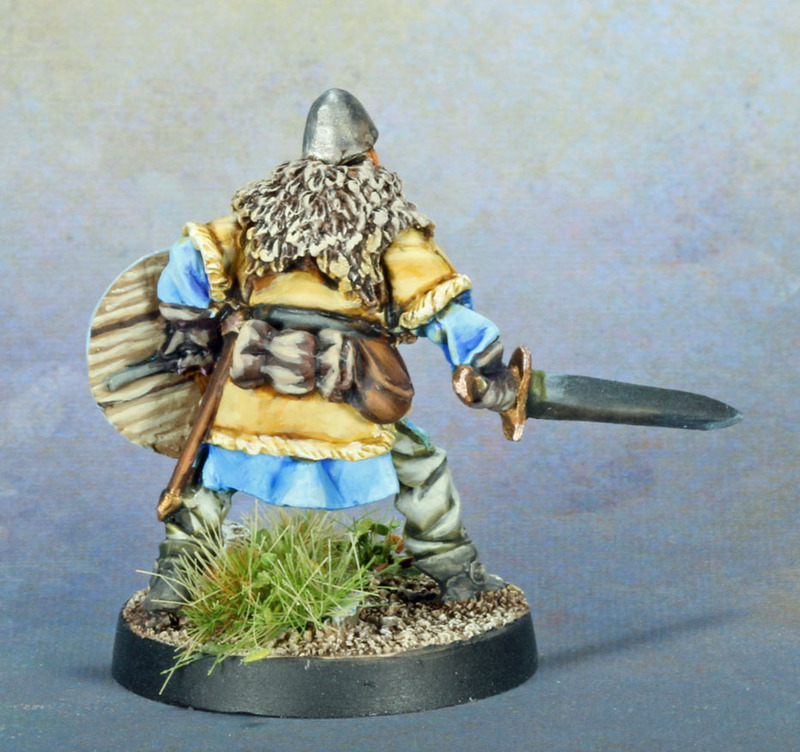 His brother Snorre had to be quicker since he could not rely on his brother's strength. Thus, he carried his sword Neck-Cleaver along with a stout shield for protection. In battle, the two always fought together, often singing as they hacked through enemy soldiers. I've clearly been painting a lot of historical models of late. But these are not purely historical, more like quasi-historical as they are from Red Box Games excellent Norse range. I plan on using these for Blood Eagle, a game that is on a little smaller scale than many historical games and it also allows for elements of myth to show up. 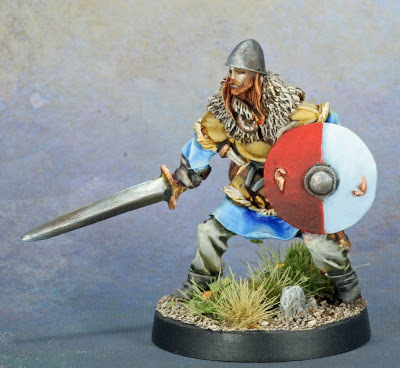 And I really like these not quite historically accurate Norse from RBG, so it worked out perfectly. This quasi-historical nature manifested in my paint jobs as well. As you can see the blues and reds are probably a little vibrant compared to what would have really existed. But I still mostly kept with muted tones. Anytime I only have to paint a small number of models for something, I try to do some experimenting. Here, I was really working on my blends, which I pretty happy with (other than the one spot on the shield where it is a little choppy) and trying to get the reflection on the metallics right. I'm less happy with that. I also did not realize I gave him a pokéball as a shield until I was taking pictures! I also have to add that the detail on the RBG models is super fine. I could barely get find any texture on the fur lining and the face of Snorre. It's not that it wasn't there, its that I filled it all up with my base coats! Hrolf wasn't actually finished anytime recently. He's been done for a while and I put pictures of him on my old Warseer project log. But I wanted to show them both off at the same time, so here he is too! He was another one where I was really playing with my blending on. 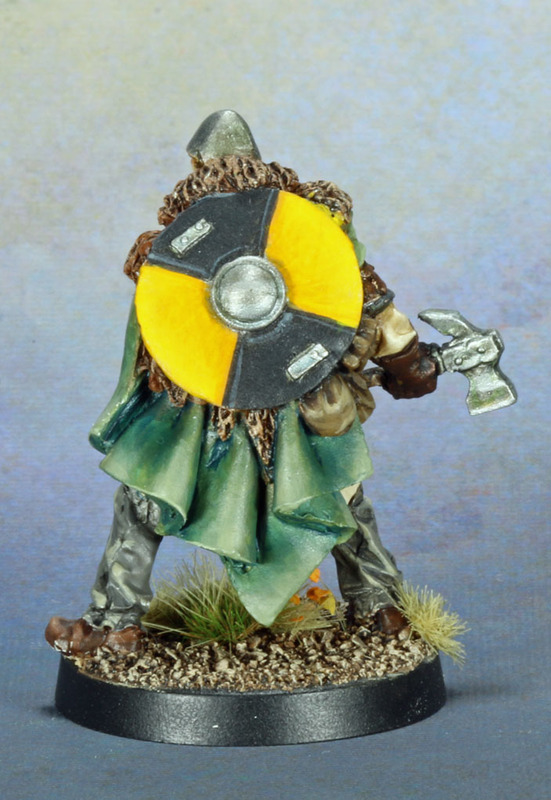 In fact, the yellow on his shield was one of the first times I ever really felt I got a smooth blend on a flat surface. 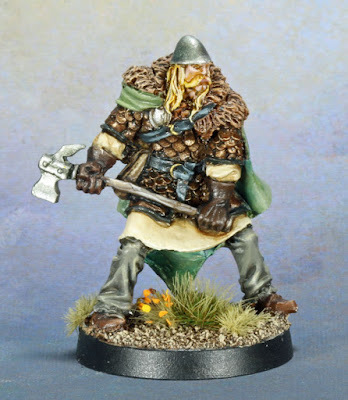 I'm really liking your Dark Age figures. Excellent work. Thanks! I've been doing a lot of them lately, they're a nice break from fantasy and sci fi models as they lack a lot of the accoutrements that add complexity to non-historical models. Love how you've painted these two. Shading on the shields especially catches my eye. Thanks! I don't have many (although I pledged for 10 more in the most recent Kickstarter) and most of the ones I have I bought if his clearance page. I try to keep an eye on that.